Since February, 2011, my brother and I have been having a dialogue about what a resilient community might look like. It all started when my brother asked me “Have you ever read The Town That Food Saved?” My brother, a voracious reader, will often begin a conversation with “have you ever read…” When I hear these words, I know I’m in for an intellectual BLEEP whipping because I don’t read as much as I’d like. I just can’t keep up with him. I did read The Town That Food Saved and although it isn’t a blueprint on how to build a resilient community, it is a smart collection of stories about what has been happening in one little town in rural Vermont. This little town started rebuilding itself after a decades-long period of economic collapse by growing food, making compost, and promoting what they had instead of trying to be something they were not. As I read the book, I noticed how many of the different farmers worked together to share tools, equipment, and ideas throughout the growing season. While most farmers own tractors, not all farmers have a full range of tractor implements. A farmer never really knows when he or she might need to borrow a tractor or a tool from another farmer and that’s why it’s always a good idea to maintain decent relationships with your farming neighbors. Farm equipment is expensive; Willie Nelson tried to explain the sad plight of generational family farms trying to “get big or get out” by mortgaging their inheritance to buy bigger and bigger pieces of progress, i.e. farm equipment. Instead of working together with their neighbors and spreading out the expenses among many, they each tried to be their own self-contained farm empire, with a full complement of tractors and equipment. They bet the farm and they lost; our regional food infrastructures are weaker today because of this. We don’t always go to The Dairy Maid when I stay at my parents’ house, but when we do, it’s always the same. I am the chauffeur, I park in a certain spot, we get our cones from Kaitie, and we enjoy our soft serve ice cream. We watch the cars go by for a bit, noting the people we know who might be doing a little grocery shopping at Food City. Then I drive the Jeep through the Mid-Town Plaza and we take a spin “up the Ridge.” I usually go all the way out to just before the Lisbon town line and take a right on the Bowdoinham Road. This is a beautiful ride in a car or on a bicycle because the Ridge elevates to nearly the highest point of land in our little town and on a clear day, one can see Mount Washington. This particular Sunday, my happy motoring spirit was in a hurry and I turned right on the Gould Road instead of going the extra couple of miles to the Bowdoinham Road. I figured I would shave off a bit of time, drop my parents back at Motel Four, and hit the highways. I carefully pulled the Jeep out and around the tractor and stepped on it a bit to get past. I beeped and we all waved at Keena and she waved back. My parents have a share in Keena’s farm through a CSA arrangement and we are all pretty happy to know exactly where some of our food comes from. As we made the short trip down Main Street and back home, I wondered what type of equipment Keena was pulling. In my writer’s mind, she was coming from the Botma Farm on the other side of the Ridge, where she had just borrowed a piece of mowing equipment. I don’t know if this is true or not, but Little Ridge Farm is a small farm and it’s quite possible that the Botma boys, who are second-generation dairy farmers, would loan Keena a mechanized farming implement. The Botmas are helpful like that; every fall they give me all the cow manure I need for my garden. Living at peace in a fragmented, polarized world is a very, very difficult thing. I don’t always do it well and sometimes I don’t do it at all. I’m working harder at it every day because it’s very possible that one day I may need to borrow a tractor. If I’m fighting with my neighbor, the likelihood of that transaction is slim to none. Live at peace with your neighbors today; you never know when you might need to borrow a tractor. This entry was posted in Farmers and tagged Earl Butz, John Gould, Little Ridge Farm, Romans 12:18, The Town That Food Saved, tractors, Willie Nelson. Bookmark the permalink. I’ve been trying to pull all these thoughts together since Moxie ended. When I saw the tractor in front of me, I smiled too. It was a divine appointment. I look forward to it, too ! “The world is too much with us…”Wordsworth. From what I can gather from Herman the German, O’Pa plowed many gardens around town with a team of horses. 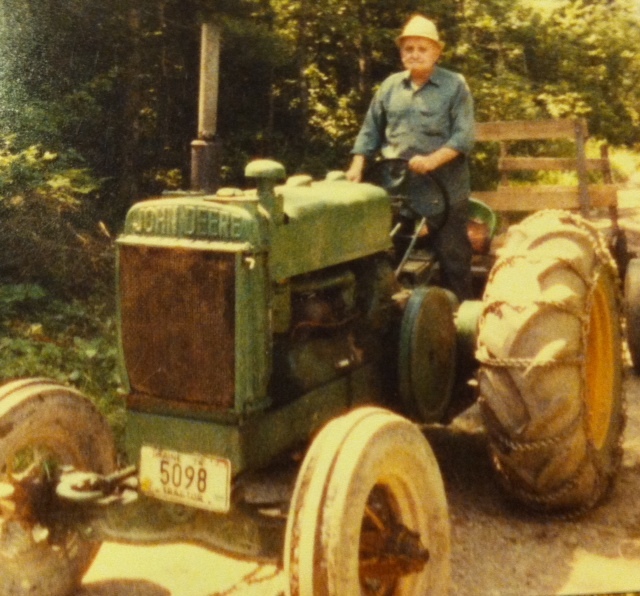 This tractor was purchased after WWII. Thanks for being part of our extended family, Aunt Faye! This was a wonderful post (not because we’ve talked about this subject) and I thought it was a perfect way to pull together everything from the Moxie weekend, and many of the Jobs for JAB tasks you’ve been about for the past several months. I love that photo of Opa. It’s on our photo wall in the living room. Whenever I see it/look at it, I’m flooded with many memories of him, and thankful for them and the lessons he taught me about how to live one’s life.